Debra Marcoux: For me, it was an incredibly moving show, and one that’s important to see right now. It was all about looking, and seeing, and there’s escapism in that. Especially since the imagery was of the ocean and the night sky, these kinds of endless scapes to get caught up in. It’s all just about that looking, and you don’t need to think too much as you experience it. Alyssa Alexander: Well, since it’s replication I would think it would involve a lot more thinking than it sounds like you’re saying. You’re saying it was about observing and reacting for you, whereas I don’t think she could’ve escaped all that much while having to focus so intently on documenting things like the night sky with as much detail as she does. D: Well, I wasn’t necessarily talking about her and her process. I’m talking about as a viewer. But, I would say, if we are thinking about the artist, it’s a lot like Agnes Martin. It’s that repetitive, slow mark-making that’s kind of a meditative process, so there’s that kind of escapism. Celmins’ work happens to be imagery whereas Agnes Martin’s was not, but her process is probably the same. There’s still not that much overthinking in her process, it’s not necessarily working conceptually. But definitely as a viewer they’re not conceptual. A: I don’t know, you had this very profound reaction to it and I just felt nothing. When you’re talking about it now, it makes complete sense how you’d have that experience but for me, walking into it, I thought it looked great but I felt nothing. I didn’t feel an escape. I didn’t feel that escape of looking at the ocean or a body of water like with what you were talking about. D: I don’t think it’s about the subject matter, really. It’s about her process and looking at these things and recording what she sees. She’s working from photographs, so she’s painting from a reproduction already, so that removes you again from the subject. We’ve gone through this process of being removed from what we’re looking at many times, and trying to capture what we’re so removed from. And there’s just so much to look at, there are so many little details, and you get caught up in discovering all those subtle details and wondering how she created them or even thought to see them in the first place. Particularly with the night skies, there’s so much detail in every single star. I must’ve spent twenty minutes at least just getting lost in what she did with the stars. With everything going on politically, you can go in there and just get lost in what she’s created. After going through the whole show, it was just very refreshing to be engaged so much that I forgot about what was going on outside those doors. That’s where I get the idea of escapism from. A: Maybe it’s just a difference in the way that I do galleries. I can’t think of a show where I spent twenty minutes in the whole show, let alone on one painting. That takes a lot for me. A painting has to immediately grab me emotionally for me to really dedicate that kind of time and allow myself to be so enveloped by it. I think a part of it was that a lot of the pieces were essentially the same. Perhaps I should’ve studied it all more, but I wasn’t compelled to really look into the subtle differences between each sky painting, or each water painting. I saw it and I got the idea and I moved on to the next piece. I did see and appreciate the detail she put into the stars, like that little halo of light around each one that you see when you’re looking directly at a light source. I did think everything was a really nice rendering, but again it wasn’t an emotional reaction. What I spent the most time with were the chalkboards. How did she redo that chalkboard? What materials were used? D: I thought the chalkboards were just beautiful. A: Yeah, like she recreated it right down to the little brushes of dust. For me, that was really interesting. I studied that much longer than any of the paintings. D: I’d never seen her sculptures. I thought those just brought her to a whole other level. A: I wasn’t familiar with the artist at all, so that’s probably part of it. You already had a jumping-off point of familiarity and appreciation for her work, but I was walking in without any connection already, without any preconceived emotional attachment. But all in all the show left me feeling very, well, what else is there? What else? I’m not saying the work wasn’t good or anything, it was very well done and impressive. A: And I do like formal approaches to art! That’s not the issue. I can’t put my finger on what I wasn’t responding to exactly. I was stuck on how these things all tied together. The rocks, the chalkboard, the sky, the sea. What was her connection to these things? How did they connect to each other? D: I didn’t even consider it. I guess the rocks and the sea and the sky all fit in terms of nature and the natural world. A: Yeah, but then there’s the chalkboard. It was so random. I’m sure there’s some type of reasoning behind it where it would all make sense. D: Maybe there isn’t a reasoning behind it. I don’t think the reason matters, really. It didn’t matter to me, at least. I think you’re looking for a much more conceptual theme to her work as opposed to just experiencing it. A: I just left there thinking why the chalkboard? It stuck out to me so much. It was fantastic, but all I wanted to know was why a chalkboard. D: It’s just like taking anything and using it as your vehicle to do what it is that you want to do. A: And what did she want to do? D: That idea of looking, studying, reproducing, translating. It’s not necessarily about a seascape or a night sky, it’s not about the things. It’s about that process. You’re trying to focus on the conceptual aspect of it when I don’t even think there is a conceptual aspect to it. A: I guess I was searching for it, yeah. Is that a bad way to approach looking at these? D: No, I just say that because so much of contemporary art has a conceptual element to it so you’re probably used to looking for it. But this is definitely more of just an emotional experience. A: It’s just that, she’s been looking at these couple subjects for a long time. Like the waterscapes started in ’86, right? That’s a good thirty-something years of studying this one particular thing. So something had to resonate with her about this one particular thing. So what was it? D: And they’re all derived from one photograph too. She’s done tons of seascapes and night skies. But it’s just like Morandi and his jars. He lived in a one-room apartment his entire life, and most of his paintings are done on the same table, from the same small collection of jars and vessels, and he used them over and over and over again. A: And you don’t think there’s a bigger meaning behind the vessels? Do the skies and the seascapes really mean nothing, and they’re just there for the purpose of the viewer to get lost in? D: It could be. Although, in the case of the skies and the seas, I do think there’s something to be said about how she chooses these vast, endless things that seem empty but are actually full of so many things. How do you go about capturing something like that? How do you go about capturing something so vast, yet with all these minute details at the same time? A: Okay, that I get. That makes sense to me. But why the chalkboard? D: You’re so hung up on the chalkboard! A: I am! Everything else is making sense to me, except for the chalkboard. I’m trying to understand it. D: There’s nothing to understand, I don’t think. It’s like asking Morandi, well why did you put a box there this one time? Does it really matter? It doesn’t matter! The point in what he’s doing is he’s studying these. It’s an act of seeing and studying them. A: So regardless of the subject matter, it’s just about the practice? A: Of seeing and observing. D: Yes. And like I was saying with Agnes Martin, there’s also an element of doing. It’s that repetition. 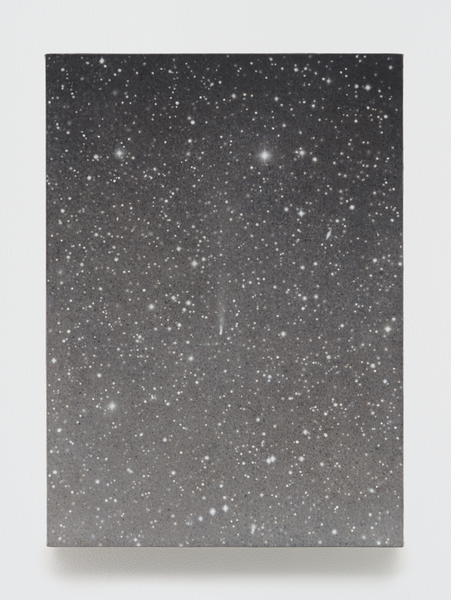 In a way, Celmins combines both the element of seeing and the element of doing. How do you even see something as big as the night sky or the ocean? Then how do you go about capturing those details? Plus since she’s working from a photograph, which already falls incredibly short of truly capturing the subject, and now she’s taking that and expanding it back out to something attempting to capture it, even though it’s further removed from the original subject. There are all these different layers to it. So that’s as conceptual as I get with it, but even just focusing on the formal aspects to it, there’s so much to get lost in, like with the variation of her greys, and the range of her values and how she chooses to use them. You get lost in trying to guess her process. It’s not escaping like in a meditative way where you suspend all thinking, but you get lost in the looking itself. And there were so many different processes to consider! She did the night skies where they were the negatives, with the white ground, so you’re flipping her process altogether there. Then in the back room there were her prints, and her drawings. The one that was done with charcoal, which is so hard to work with, and yet she still managed to get all this variation and capture all this minute detail. With her mesotints, there’s the control over how long you leave it to burn in and how dark it’s going to get. There was so much for me to try and wrap my mind around. A: I guess for me I was just so distracted by all my unanswerable open-ended questions. That felt frustrating to me, not like something I could get lost in. If you’ve seen the show, which reaction rings true to your experience? Is having an understanding of the meaning behind the work important to your enjoyment of a show? 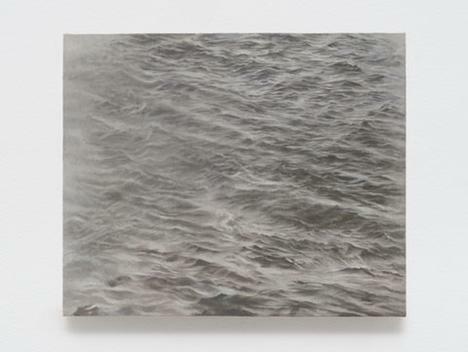 If you haven’t seen it yet, it will be on view through April 22nd at Matthew Marks, 522 W 22nd Street. I really enjoyed this conversation! 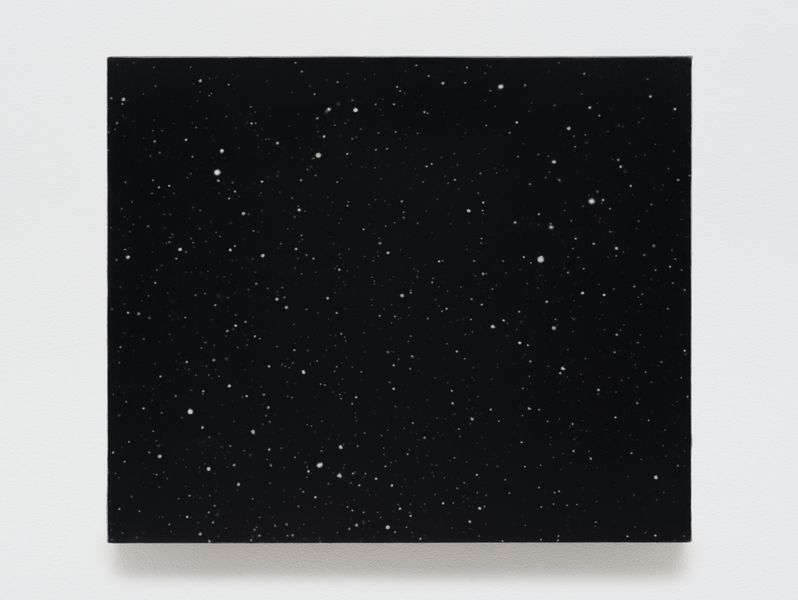 I'm a fan of Vija Celmins work and did not see the show, but your conversation made me feel like I did. I like the question you pose at the end. "Is having an understanding of the meaning behind the work important to your enjoyment of a show?" I have noticed with my own work that people in the contemporary academic field tend to latch on to intellectual concepts and seek them out while others, like myself, look for an emotional response. 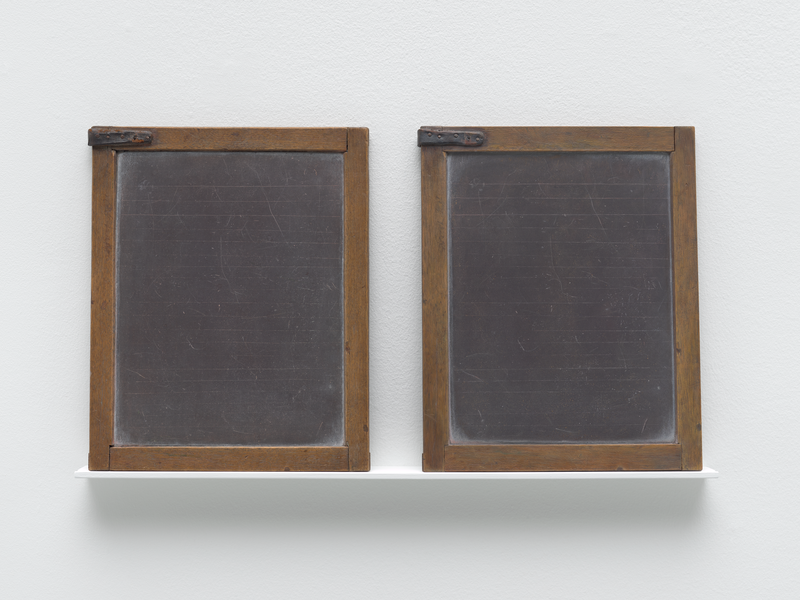 Perhaps the curator put the chalkboards in to illicit a conversation! Sometimes we forget that in many cases the curator chooses the art. Thank you, I really enjoyed this conversation!